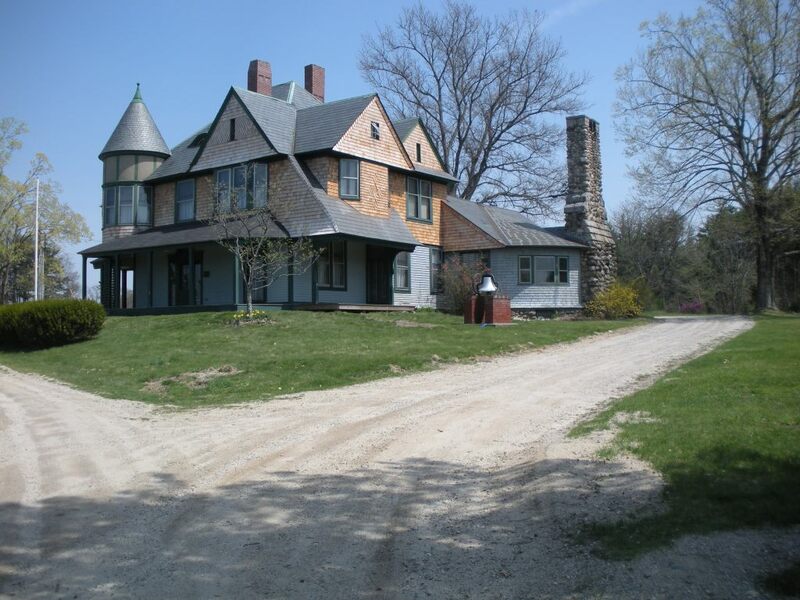 This week we look at Alvirne, the summer home built in 1890 by Dr. Alfred and Virginia Hills on a knoll in the field across from the Alvirne farm house. Their primary residence was in New York City but rail travel to Nashua’s Union Station and a coach drive from Nashua to Hudson facilitated travel to Hudson. We can only imagine the entertainment and festivities enjoyed on these grounds by the Hills as they mingled with guests from New York as well as locals from Hudson and Nashua. 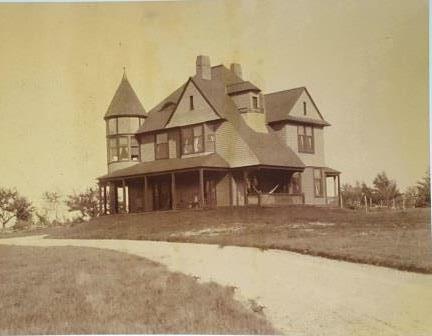 Our first photo shows the home in 1890. You will notice that the meeting room and the field stone chimney were not part of the original building. These were added in 1891. You will also note that the driveway did not encircle the house. This summer home, now called the Hills House, was enjoyed by Alfred, Virginia, and also by Virginia’s mother, Mary Creutzborg. Although they had two daughters neither of them lived beyond infancy. Virginia passed in 1908, a true loss to Dr Hills and their friends here in Hudson. Dr Hills completed his plans for the Alvirne Chapel; Virginia and their infant daughters were laid to rest within this chapel. A short time later, in 1910, Alfred married Jessie Norwell, a Nashua native. Alvirne continued to be the summer home of Dr Hills, Mary Creutzborg, and Jessie. After Dr. Hills passed in 1920, Jessie, her sister Helen Norwell, and Mary Creutzborg continued the use of this summer home. Dr Hills left a provision in his will so that Jessie, his third wife, and Mary, his second mother-in-law, could co-habitate in the summer home as long as the arrangement satisfied both parties. Mary passed in, 1928, at the age of 102, spending many years living with Jessie, either in Nashua or Hudson. Jessie passed in 1963; but not until she saw her husband’s vision of a school named Alvirne established in Hudson. To see if the district will vote to authorize the School Board to raze the vacant dwelling on the Derry Road known as the Hills House. A school board member rose to move adoption of the article. This opened discussion and Zoula Rowell, a member of the Hudson Fortnightly Club, rose to speak in opposition. The article was tabled…ultimately forever. This action provided the incentive for the incorporation of the Hudson Historical Society with a goal of preserving the Hills House and using it as a museum of Hudson History. For about 10 years prior to this time, the Historical Committee of the Fortnightly Club was actively collecting and cataloging items pertaining to Hudson History. The Hills house was found to be structurally sound; but in need of repairs, cleaning, and the decorating of individual rooms. Over the next few years a community effort occurred; individuals, organizations, and families helped with this project; some taking responsibility of an entire room. A caretaker apartment was established and a caretaker secured. As rooms became available the historical items collected by the historical committee were moved to the Hills House. Some of the Hills family furnishings were returned; many other items were donated by Hudson families. The catalogue system used by the historical committee was continued by the society. The success of this restoration was climaxed in 1983 when the Hills House was named to the National Register of Historic Places. Ironically, the generosity of Dr Hills provided for the building and maintenance the Hills Memorial Library, Library Park, Alvirne High, and Alvirne Chapel. He took no similar precautions for his lovely summer home. That responsibility is now being met by the Historical Society with support of the School District and various organizations in town. Our second photo shown the house just a few years ago, Both photos are from the Historical Society collection. The year 2016 marks the 50th anniversary of the incorporation of the Hudson Historical Society. By Ruth M Parker in Alvirne, Derry Rd, Uncategorized on February 19, 2016 .